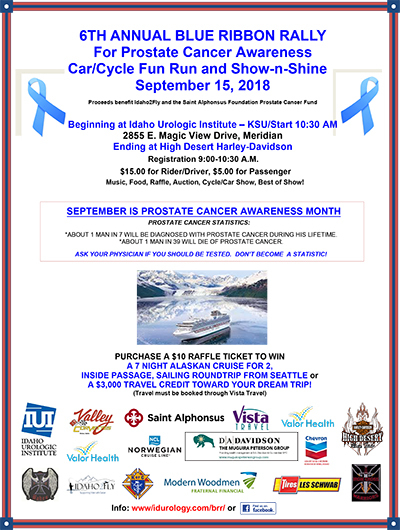 Idaho Urologic Institute, the Iron Cross Warriors and Babes, High Desert Harley Davidson, Valor Health, Valley Corvettes, and Valley View Chevron in Horseshoe Bend proudly present the 6th Annual Blue Ribbon Rally for Prostate Cancer Awareness on September 15th, 2018, beginning at Idaho Urologic Center at 9:00 am and ending at High Desert Harley Davidson. Registration begins at 9:00 at 2855 E. Magic View Drive in Meridian with riders and drivers leaving IUI for a fun run at 10:30. We invite all motorcycles and cars to participate in the fun run and enjoy a beautiful fall day in southwest Idaho! Registration is $15 for drivers, $5 for passengers. Proceeds benefit Idaho2Fly and the Saint Alphonsus Prostate Cancer Fund. The ride will end at High Desert Harley Davidson, 2310 E. Cinema Drive in Meridian, beginning around 1:30 as the cars and cycles return to Boise after the fun run through Emmett and Horseshoe Bend. Join us for Music, Food, Raffle, Auction, Best of Show and an awesome time at Harley as we raise money to benefit these two great Idaho charities! Find us on Facebook. . This year we are selling raffle tickets for $10 for a 7-night Alaskan Cruise for 2, inside passage, round trip from Seattle or a $3,000 travel credit toward the trip of your dreams through Vista Travel. Need not be present to win and no cash in lieu of prize. Tickets are available at IUI in Meridian, Boise, and Nampa and will be available the day of the ride at both IUI and High Desert Harley Davidson. See event flyer below for details.